In the article below independent historian Robin Loftin explores the past, present, and possible future relationship between the world’s most populous nation and people of African ancestry. Africa and China have had contact for more than a thousand years. Some scholars assert that the contacts began as early as 4th century A.D. but convincing evidence is sporadic or lacking. Beginning with the Tang dynasty (618 A.D. to 907 A.D.) documented evidence of contact and trade exists showing a relationship between China and the city-states of east Africa. This relationship has evolved over the centuries and led to a migration of Africans to China to study, trade, and act as diplomats. At least one account indicates that Du Huan was the first Chinese to visit Africa, probably in Nubia, during the 8th century A.D. Since the 7th century, Africans have maintained a consistent commercial relationship with China. During the Tang Dynasty, Arab traders brought African slaves from east Africa to China. They comprised one of the many commodities in the Arabs’ large-scale maritime trade with China. During this era, the first Chinese cultural perception of African people developed. These “dark-skinned” people were known as Kunlun. They were described as lower class, ignorant, scary, and dangerous. Although there were far more enslaved Chinese, some wealthy Chinese preferred the exotic Kunlun slaves. African slavery in China peaked during the Tang and Song (960 A.D. to 1279 A.D.) dynasties but the number of African slaves taken to China during this 608-year period is unclear. By this point Chinese perceptions of the Kunlun became more complex. These perceptions ranged from strong and mysterious to frightening. The Kunlun in the Tang Dynasty era were portrayed in numerous stories of the period as heroic, resourceful, and—ironically culturally Chinese. Most Chinese during this period, however, unless they were very wealthy, had little contact with African slaves, perhaps explaining the differing views of the Kunlun. 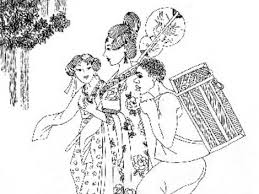 During the Song Dynasty the numbers of African slaves increased in China. Most came from Madagascar and the Comoros Islands and thus indirectly from Africa, since the Arabs brought sub-Saharan Africans to both areas. Most Kunlun slaves in China lived in Canton Province. By this time they were mostly viewed as a displaced people who lacked the ability to adapt to the Chinese environment. They were also described as savages with unintelligible speech. While the Kunlun slaves were dehumanized as savage and scary, the Chinese view of free Africans was different. Many of these Africans were treated with respect and honor. East African merchant Zhengjiani, for example, in 1071 arrived in China and was treated with the utmost respect and honor. Zhengjiani and his party were honored as the first African foreign merchants to be received by Chinese Emperor Shenzong (1067-1085). The emperor gave a Chinese title to Zhengjiani; he became known as “Lord Guardian of Prosperity.” The Song court regarded Zhengjiani and his entourage as ambassadors of their country even though they were simply merchants. 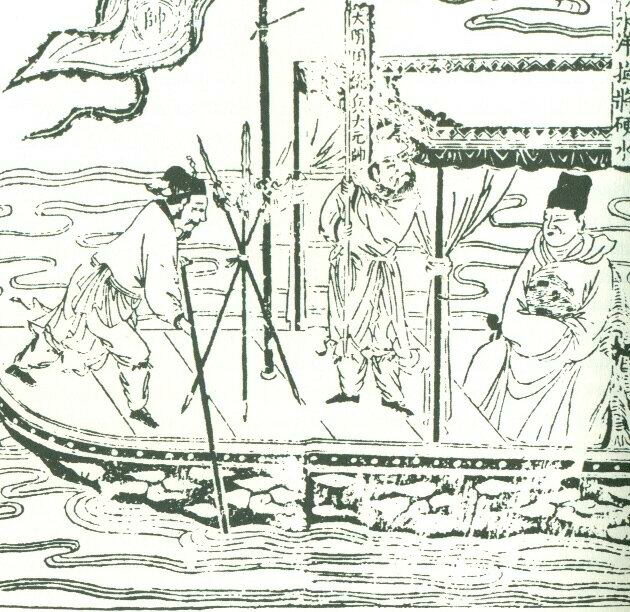 In 1081, Zhengjiani and his group returned to China. At that time, the Song emperor lavished attention and gifts, including a large amount of white gold on them in recognition of their journey. It is unclear whether Zhengjiani was at this point an appointed ambassador of Zengdan (what is now the east coast of Africa) or a wealthy merchant. However, it is clear that his travels to China and his acceptance into the Song courts were an important diplomatic development between Africa and China. This diplomatic acceptance was built on a foundation of profitable trade. By the 11th century large quantities of highly valued African products (particularly ivory used for palanquins and belt buckles), powdered rhinoceros horn (used as an aphrodisiac), tortoise shell (to treat consumption), and frankincense (to stimulate circulation) were imported from the east African city states. The Yuan dynasty (1271 A.D. to 1368 A.D.) witnessed expanded contact with Africans through trade and diplomatic missions sent to Madagascar. Moroccans also arrived in China during the Yuan dynasty, visiting Quanzhou in south China as well as Hangzhou and the port city of Guangzhou. By the time of the Ming Dynasty (1368 A.D. to 1644 A.D.) there was extensive trade between the Chinese and the east African city-states of Mogadishu, Malindi, and Kilwa in the modern nations of Somalia, Kenya, and Tanzania respectively. The Chinese imported ivory, rhinoceros horn, amber, and exotic animals such as zebras, ostriches, and giraffes from east Africa. In turn, the city-states received silk, porcelain, and lacquer. During this period, Zheng He, China’s most important admiral and admired navigator, travelled to the coast of east Africa bringing gold, silver, satin, and porcelain. In 1416, he made the first direct official contact with east Africa, visiting Mogadishu in modern Somalia. Over the next four centuries the rise of Europe and in particular European trade and colonial expansion marginalized Chinese-East African contact. Both the Chinese and the Africans now looked to Europe and the West rather than each other as trading partners. Trading connections between China and East Africa were not lost but neither were they considered particularly important in this new era of global commerce. By the 19th and 20th centuries, however, the relationship between Africa and China became important again as commodities like herbs, spices, and precious goods changed hands. Moreover, by the early 20th Century, African Americans for the first time began to develop contact with—and experience in—China. The first significant African American contact with “modern” China came during the Boxer Rebellion. Troops from the 10th Cavalry, one of the four famed Buffalo Soldier units, were part of the international military force of 20,000 soldiers sent to suppress the uprising led by the Society of the Righteous and Harmonious Fists (Boxers) and to free foreign hostages and Chinese Christians held by them. Between World War I and World War II African American jazz musicians such as the Earl Whaley Band of Seattle, Washington, rose to prominence in Shanghai and other Chinese coastal cities. Some of these musicians eventually ended up incarcerated by the Japanese when they invaded China in 1937. Far larger number of African Americans came to China during World War II. Most of these visitors were soldiers who worked as manual laborers or heavy equipment operators. However a small number of African Americans worked as doctors and nurses staffing hospitals for injured American and Chinese troops. African American soldiers who worked to re-open the Burma Road were the single largest group of blacks in World War II-era China. The Road ran through the Himalayan Mountains and linked India and China. Six African American battalions, who comprised 60 percent of the U.S. soldiers working on this project, labored side-by-side with Indian, Burmese, and Chinese laborers to construct the 271-mile Ledo Road which connected to the Burma Road. The Ledo Road was later described as a “wartime engineering miracle.” Relations between Chinese and African American soldiers were reportedly good during work on the Ledo Road and later in China immediately after the war. On October 1, 1949, China officially became a Communist nation. Like the Soviet Union and other Communist nations, China recruited Africans to study in its universities in a bid to gain support among the emerging generation of Third World political leaders. At first these numbers were small but by the 1960s, there were enough African students in China to lead to racial tensions and protests. Much of the tension was rooted in the Chinese government’s decision to provide large scholarships to Africans from “China-friendly” nations. Over time there would be growing numbers of African students studying in Chinese universities especially in Beijing and Shanghai. Many Chinese students resented the African students receiving larger scholarships and greater support from their government than the Chinese students. Interracial dating between African men and Chinese women added to the tension. In 1979, the first physical confrontation occurred between African and Chinese students in Shanghai. More clashes followed prompting some African students to return home voluntarily or to be deported. The single largest clash came on December 24, 1988 at Hohai University in Nanjing when two African male students arrived at a party with two Chinese women. When security guards stopped the group, claiming that the Chinese women were prostitutes, a brawl ensued which left 13 students injured. When a false rumor that one of the Chinese students in the melee had been killed, over 300 Chinese students attacked the dormitories housing the African students. Despite the tensions among university students, Africans and increasingly African Americans have been a growing presence in the country since 1990. By 2014 an estimated 500,000 Africans, Afro-Caribbeans, and African Americans were present in China. In comparison there are about one millon Chinese living in Africa. All the groups came to China to engage in the lucrative import and export business or as students or tourists. Most Africans are concentrated in the port city of Guangzhou. By 2014 an estimated 16,000 Africans lived in this city of 11 million people, the fourth largest city in China. African immigrants first arrived in the late 1990s as traders. Most of the traders purchased textiles and other relatively inexpensive consumer goods in Guangzhou and sold them for a profit in their home nations. Some traders have stayed permanently but much of the population has been transitory. Nigerians constitute the largest of the African groups in Guangzhou, followed by traders from Senegal, Mali, Guinea, and Ghana. By 2000 they became enough of a noticeable presence that the small section of Guangzhou where they lived and worked was informally called the “Chocolate City.” Their numbers have allowed these African immigrants to establish their own services, accommodations, and centers of entertainment. Since the 2008 Olympics in Beijing the number of foreigners from all regions of the world has risen with Africans among the fastest growing groups. Since few African immigrants in Guangzhou speak Mandarin, Cantonese, or other Chinese languages and most Chinese in the city speak little or no English or French, the two groups have developed what is known as a “calculator communication” in which both parties communicate and negotiate primarily by punching numbers into a calculator to present to the opposing party. There is very little “non-business or non-commercial” interaction between Africans and the Chinese population. A second concentration of Africans has evolved in the small city of Yiwu in Zhenjiang Province in the Southern coastal region of China. Although relatively small by Chinese urban center standards with a population of about one million people, it has the largest commodities trading market in the nation. Beginning in the late 1990s, Ethiopians and Sudanese have settled here. As in Guangzhou, most of these emigrants are in the city for trade. They purchase manufactured items, jewelry, ornaments, toys, building materials, and electrical appliances, and return them to their home countries for sale. The Yiwu African colony however seems to have developed a more permanent community, centered around churches and a mosque. Unlike the African inhabitants of Guangzhou, the Yiwu Africans have made a greater attempt at assimilation into the local Chinese community. Smaller groups of Africans are located in Beijing and Shanghai. Africans in these cities are primarily in China for educational reasons (either as teachers or students) or in a diplomatic capacity. 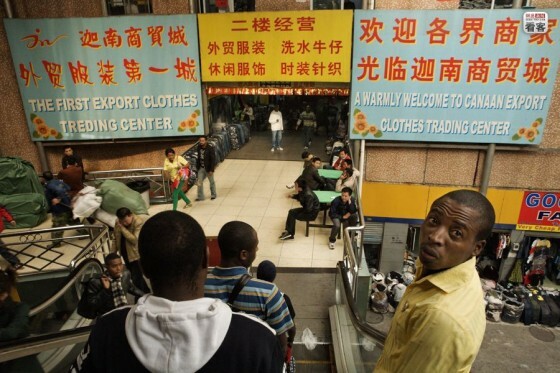 Some Africans in Beijing and Shanghai also work as businesspeople or traders. African Americans comprise a smaller and less permanent part of China. Since their first brief appearance in the Boxer Rebellion, a few African Americans have visited China mostly as famous travelers. The poet and writer Langston Hughes toured China in 1934 after he left the Soviet Union. While in Shanghai he met Lu Xun, the father of modern Chinese literature. W.E.B. DuBois, who first visited China in 1936, returned in 1955 as part of a trip around the world. He was received with great acclaim and met with Communist Party leaders. He returned a third time with wife Shirley Graham DuBois in 1959 and on this trip met with Mao Zedong, the head of the Communist Party and the leader of China. In 1977 Shirley Graham DuBois died in Beijing, China after a long battle with breast cancer. In the 1960s and early 1970s black American radicals including Black Panther Party co-founder Huey P. Newton and Elaine Brown made the political pilgrimage to Beijing to meet with Chinese government officials. Less well known were left activists such as Harlem-born Vicki Garvin who lived in China from 1964 to 1970. Another radical, Robert Williams, in 1966 began a long exile in China where he met with Mao Zedong and advised him on racial issues in the United States. All of these radicals saw China rather than the Soviet Union as the new leader of Third World liberation. Likewise at least in official party circles, black liberation struggles in the United States and other nations were applauded and official China denounced anti-black racism both at home and abroad. Chinese Communist officials promoted the idea that the Chinese people stood shoulder to shoulder with Africans, African Americans, and other people of color against “white imperialists.” As we have seen with the anti-African student tension, many ordinary Chinese people were reluctant to embrace that concept. Nonetheless, African American (and African) writers and intellectuals, sports figures including especially black basketball stars have been exceedingly popular in China since the 1980s. They and the black American revolutionary heroes who visited China have reported that negative stereotypes and racial difficulties have decreased. Since 1980 a small group of non-celebrity African Americans have toured, studied, and—on occasion— settled permanently to work in China. Most of them are located in Beijing and Shanghai. These African Americans report mixed experiences living or visiting China. Those who resided in the major cities frequently touted excellent opportunities in business, teaching, trading, and study. Upon visiting rural areas, however, they often had “Afro-phobic” experiences where blacks were still viewed as scary, unintelligent, and poor. As with Africans however, language difficulties, even for those in the major cities, often cause social and cultural problems. In the larger cities like Shanghai and Beijing, many African Americans report that Chinese view them as exotic and mysterious while, in the rural areas, they are sometimes described as “ugly.” African Americans in China are often mistaken as African or Afro-Caribbean and, therefore, experience many of the same problems. Inter-racial dating between African Americans and native Chinese is not popular and even discouraged by Chinese parents. Compared to many locations around the world, China presents certain challenges that are unique to Africans and African Americans. 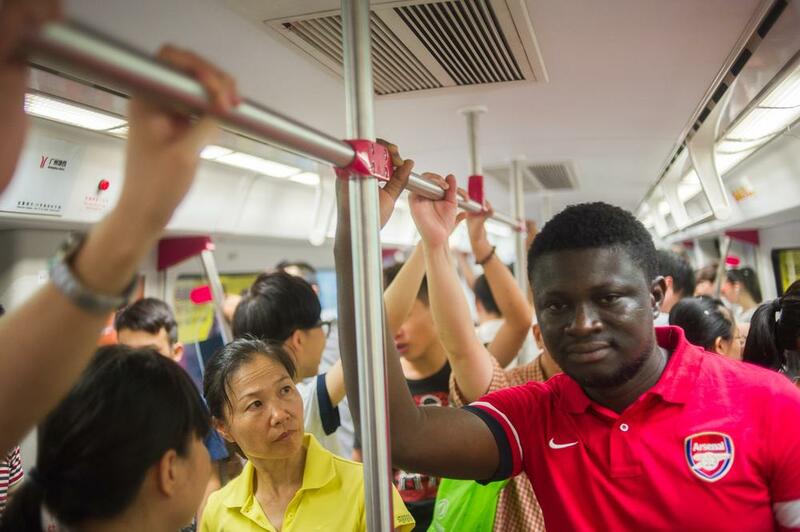 As a homogenous society, China can be a difficult tourist and expatriate location for persons of African origin. Most Chinese have had limited contact with black people and therefore have allowed stereotypes and other derogatory information to affect their opinions and interactions. Nevertheless, Africans and African Americans are developing stronger ties with China as shown by their rising numbers in the country, willingness to learn a Chinese language, and to trade and establish businesses in China. In recent years, China has opened up to foreigners and many African Americans and Africans have responded to this opportunity to benefit from China’s large trading, manufacturing, and educational possibilities. Still, racial problems and race-motivated incidents continue to occur. As the native Chinese population experiences more direct contact and social interaction with foreigners, particularly Africans and African Americans, China has strong potential to be a new frontier of opportunity. Don Wyatt, The Blacks of Premodern China (Philadelphia: University of Pennsylvania Press, 2010); Philip Snow, The Star Raft: China’s Encounter with Africa (Ithaca: Cornell University Press, 1988); Adams Bodomo, Africans in China: A Sociocultural Study and its Implications for Africa-China Relations (Amherst, New York: Cambria Press, 2012); Julie Wilensky, “The Magical Kunlun and ‘Devil Slaves’: Chinese Perceptions of Dark-skinned People and Africa before 1500,” Sino-Platonic Papers 122: 1 (July 2002);Marc Gallicchio, The African American Encounter with Japan and China: Black Internationalism in Asia, 1895 – 1945 (Chapel Hill, NC: University of North Carolina Press, 2000); Robin D. G. Kelley and Betsy Esch, “Black Like Mao: Red China and the Black Revolution,” Souls (Fall 1999). http://africansinchina.net/. “Black Like Mao: Red China and the Black Revolution,” Souls (Fall 1999). http://africansinchina.net/.